Dynamics Software, a leading provider of solutions based on Microsoft Dynamics 365, announced today that its Advanced Field Service 2.0 solution is available on Microsoft AppSource. 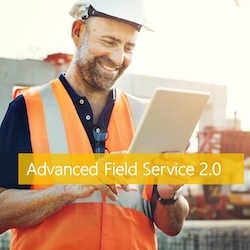 Veenendaal, Netherlands, February 27, 2018 --(PR.com)-- The latest release of Advanced Field Service, a Dynamics Service solution from Dynamics Software, offers additional functionality on top of Dynamics 365 for Field Service. Microsoft Dynamics 365 for Field Service allows organizations of any size to deliver intelligent, world class field service, managing all aspects of the end-to-end field service management cycle. Reshaping the field service management landscape is becoming necessary especially with the plethora of possibilities that IoT offers in facilitating implementation of new business models as well as the changing nature of field technician mobility. This makes management of the field service cycle even more critical and Microsoft Dynamics 365 for Field Service offers out of the box IoT integration to help you be future ready. Dynamics Software understands your need to streamline operations when facing increased competition and cost-cutting initiatives and realizes that to maintain competitive advantage, real-time data and innovative service methods are vital for field service enterprises to ensure customer delight, increase revenues and expand profit margins. A focused and futuristic enterprise service strategy is essential to achieve this. Microsoft Dynamics 365 for Field Service and Dynamics Software Advanced Field Service 2.0 together provide a powerful and agile solution enhancing field service and enabling a profit based service company. Customer asset address, customer asset properties, customer asset designer, customer asset templates, customer asset warranty, agreement customer assets, agreement coverage, improved work order actuals registration & extended case management integration are out of the box available in Dynamics Software Advanced Field Service 2.0 and provides a solid basis for the implementation of Dynamics 365 Field Service. Ben Vollmer, Worldwide Dynamics 365 Field Service Lead, Microsoft Corporation said, "We're pleased to see the work Dynamics Software is doing to benefit our mutual customers. The availability of Dynamics Software Advanced Field Service 2.0 on Microsoft AppSource offers companies a chance to trial and select a solution that enhances Dynamics 365 Field Service with functionality that helps customers meet their specific needs without configuration or customization."